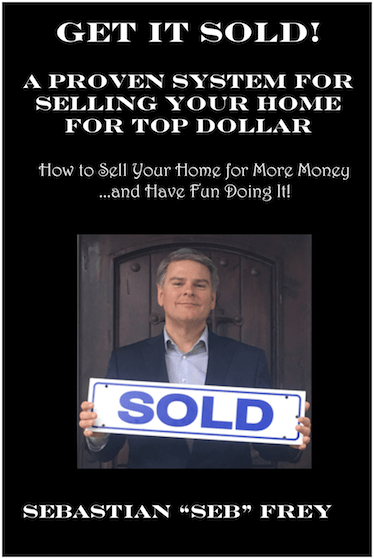 This coming January 24th, 2019 local author and real estate broker Sebastian “Seb” Frey will be putting on a “Savvy Seller Seminar” for home owners thinking about selling their homes in 2019. This novel home seller seminar will be held from 6:30 to 8:00 PM at the Best Western Seacliff Inn (home to Severino’s Bar and Grill) on Old Dominion Court, just off Highway 1 / State Park Drive, across from the Rancho Del Mar Shopping Center. The Bay to Bay Podcast shines a spotlight on life in the San Francisco and Monterey Bay region of California. Produced by local REALTOR Sebastian “Seb” Frey, this groundbreaking podcast features guests who hail primarily from the area. Guests on the show share information about matters affecting those of us who live in or visit he area. Recently, two guests from Aptos appeared on the podcast. The first was Kristina Campbell, a local real estate appraiser and also Aptos resident. Kristina answered all manner of questions about real estate appraisal, and cited many examples of appraisal work in local Aptos neighborhoods. Anyone thinking of buying, re-financing, or selling a home in Aptos would do well to listen to this informative episode. In the most recent episode of the podcast, Aptos archaeologist Dustin McKenzie of the Cabrillo College anthropology department talked about local archaeology. How long have humans lived in our area? Where did they come from? What was their culture like? Where can we go to see traces of the people who lived in California in ancient times? Anyone interested in our area’s history will find this to be an interesting and entertaining episode to listen to. What’s a podcast? A podcast is like a radio show, only it doesn’t broadcast over the air. Rather, the audio from each podcast is stored on the Internet and is typically downloaded or streamed to a device such as an iPod (hence the name, Podcast), iPhone, tablet, or other mobile device. Many people enjoy podcasts as they commute to or from work, at the gym, or around the house. There are thousands of podcasts available on every imaginable topic. They can easily be found in on-line directories, such as the iTunes Store, Stitcher Radio, and the Google Play. Spring is in the air! Like all of you, I’m thankful for the copious amounts of rain we’ve had this winter – but enough’s enough! I’m loving the sunshine, and I’m looking forward to the weather heating up. But the Aptos real estate market has galloped ahead of mother nature: it’s plenty hot already! Would you believe this: the Aptos median home price, February 2017: $1,050,000! Everyone thinks that the spring heralds the start of the traditional real estate sales season. Truth be told, we don’t have much seasonality in the Aptos real estate market. While the market may take a bit of a slow down around the holidays, it’s usually roaring right along half way through January. And that’s borne out this year, because many of those February 2017 closings were initially listed for sale in January. Compared to last year, it’s been a busy start to the real estate year: 15 single-family homes sold in Aptos in February 2017. You’re thinking that’s not a lot – but it’s 36% more than a year ago, when only 11 sold in February 2016. Those 15 homes sold in an average of 52 days – about the same as last year at this time, when they sold in 51 days on average. Sellers received 98% of full asking price in February 2017 – a smidgen better than the 97.6% they received a year prior. The #1 favorite topic among the water coolers in the local real estate brokerages is real estate listings – where is the inventory?! 25 new single-family home listings hit the Aptos market this past February. A year ago? 26. But wait, we’re a week into March already, so how are we looking now? Just 4 new listings in the first 7 days in March 2017 – a year ago, we had 7 new listings by now. A lot of folks are going to see the $1,050,000 February 2017 median sale price and say, “Wow! That’s really high!” And it is – but the median home price in January 2017 was even higher – $1,145,000. And in February 2016, the median home price was $1,059,000. These prices aren’t an anomaly – upper-end homes in Aptos are selling, comprising about half the market. It may look like even at $1,050,000 the median sale price in February 2017 came in a little weak – but I put that down to the low sales volume. 15 sales does not represent a huge pool from which to draw meaningful conclusions, but it does indicate a market that is at least holding is own, at least for the time being. Interestingly, Zillow now rates zip code 95003 as only a 6.1 out of 10 on its “market health” score. The “health metrics” I monitor most closely are median sale price, days on market, sales to list price ratio, and absorption rate. Right now, there are 49 single-family homes listed for sale on the Aptos MLS, but only 26 of them are available for purchase (the rest are already under contract). The way I figure it, we’re looking at around a 51 day supply of homes for sale in Aptos – and that means we are still in a very low-inventory hot seller’s market. The $6,400,000 question is: but for how much longer? Aptos Real Estate Broker Writes New Book: Get It Sold! Local Aptos real estate broker Sebastian “Seb” Frey has written a new book: Get It Sold!, which is his unique perspective on the fine art of home sales. While there are hundreds of books written on this very topic, relatively few are written which focus on just the northern California region. And this may be the only book written by a Santa Cruz-based real estate broker which focuses squarely on the needs of Santa Cruz county area home owners. The book is designed to be an easy read – at just 110 pages, it can be absorbed in just an hour or two. It maintains a conversational style throughout, to help keep the reader engaged and turning pages. The goal for the book is simple: to show home owners what they can do to sell their home quickly, but for the absolute highest price the market will bear. And of course, with the least amount of hassle, risk, and uncertainty. Get It Sold! takes readers through the whole process of getting homes sold at peak pricing. It starts by discussing the decision to sell, then moves on to getting the home prepared for sale, staging for maximum appeal, creating and executing a full-blown, attention-getting marketing campaign, and covers savvy negotiation techniques to wring out the maximum sale price of the property. The book is available on Amazon.com for $12.95, but it is being made available to Aptos-area home owners for free – and Seb even covers shipping and handling! To order your copy Get It Sold! with free shipping, click this link. Happy reading! It’s a whole new year, Aptos! And that means it’s time for my Aptos Real Estate Update January 2017. Before we forget completely about what happened in 2016 (and I can’t blame you for trying! ), let’s take a look back and see what the Aptos real estate market was like in the final month of 2016. Without further ado, I’ll tell you that the median price for single family homes in Aptos in December 2016 was $912,250. That’s a fair bit less than the $968K we saw the month prior, but it is up a whopping 18.8% compared to a year ago. Yep, in December 2015 the median price stood at a lowly $779,000. What a difference a year makes! But a single month doesn’t provide enough home sales to produce a really meaningful statistic. So I looked back at the whole year, January to December, and saw the median price for single family homes in Aptos was $874,000 with 258 homes sold. I looked back one year past that, and in 2015 we sold 334 homes in Aptos, with a median price of $827,500. That means that as a whole, home prices were up only 5.6% in 2016 versus 2015 – but home sales actually plummeted, down nearly 23%! But December was a pretty decent month for home sales in Aptos – 22 homes were sold last month, about the same as this time a year ago (23 sold in December 2015). And they sold about as quickly as they did a year ago – in 85 days on average, versus 83 days on average in the year-ago period. Sellers received 95.5% of full asking price last month – which is actually a pretty big discount compared to most months – for example, a year ago in December, sellers received 96.5% of full asking price. We had exactly the same amount of new inventory available in December 2016 vs. 2015 – 9 single family listings hit the market both years at this time. Last year the median list price was $829K; this year, the median asking price for new listings in December was $1,049,000 (and THAT home went under contract in 1 day!). When it comes to inventory, it’s the same sad story – we have just a 50 day supply of single family homes available for purchase in Aptos as of this writing. There are presently 53 homes listed on the Aptos MLS, but 28 of those are under contract with only 25 available for purchase. Bad news for buyers, but GREAT news if you’re looking to put a house up for sale soon. As we begin the new year, mortgage interest rates are about where they were a month ago, with 30-year fixed rates hovering around 4.15% for many types of borrowers and loans. Rates had risen sharply after the election, and there was a fear that rates would continue to rise, however they appear to have stabilized for now, and are still quite low by historical standards. While interest rates have been stable over the past month, most talking heads are predicting that interest rates will be rising throughout 2017. There’s a growing optimism that the economy will continue to pick up steam, which will in turn drive up the demand for money and borrowing costs. The Mortgage Banking Association is predicting that rates will gradually rise, hitting 4.7% at the end of the year. Despite the rise in interest rates, most “experts” are still predicting that home prices will continue to rise in the United States – albeit at a much more gradual pace, somewhere around 3-5%. Check out this article on Forbes and also this on the Wall Street Journal. If you’re looking for a 2017 prediction closer to home, check out the 2017 California Market Forecast by Leslie Appleton-Young, Chief Economist for the California Association of Realtors. Yawn. The condo market in Aptos was pretty sleepy last month. Only 6 condos and townhouses traded hands last month, and the median price was $579,650. That’s up just about 2.5% compared to a year ago – in other words, accounting for inflation, condo prices have gone nowhere in Aptos over the last year. The 6 condos that sold did so in an average of 69 days (vs. 50 days a year ago). Condo sellers did receive 98.6% of full asking price though – better than last year (they got only 97.7% in December 2015). If you are thinking about selling your condo or townhouse in Aptos soon, I’ve got some really great news for you. There are presently just 27 condo listings in Aptos; 15 of these are available for purchase, while 12 of them are pending sale. According to my calculations, that works out to a 56 day supply of inventory of condos and townhouses in Aptos – very slim pickings! Sellers in this market have next-to-no competition for their homes. It’s only been a month or so since my last real estate market update – but wow, a lot can happen in a month! Would you believe…Donald Trump is now President-Elect? I wrote a whole piece and did a video about what that means for your home’s value last week, and it’s already had hundreds of views. If you’re interested to hear what may be in store for your Aptos home’s value in the coming months and years, it’s worth a read. But here in the Shire, err, Aptos, that is, things are looking rosy. I don’t know about you, but I’ve been enjoying the rain and I hope it keeps up! It hasn’t dampened home prices, that’s for sure – the median single family home price in Aptos in October 2016 was $856,000 – that’s up 10.8% year-over-year, and up 5.6% from the prior month. We closed 25 homes in October – down 7.4% from a year ago, and those homes sold in an average of 48 days on market (vs. 40 days on market this time a year ago). If you’re thinking about selling your home this fall or winter, here’s some more good news: we are down to just 71 days of inventory. That means if you’re looking to buy, there are slim pickings – a 2.4 month supply of homes means this is a very strong seller’s market. Owners who do a good job pricing their homes will usually be rewarded by getting multiple offers and a sale price often high over asking price. Speaking of pricing your home, I thought I’d share with you something interesting that’s happening right in my own neighborhood. I live in a small little self-contained neighborhood near Cabrillo College, and there are two homes up for sale right now: the “cheap” house is 2839 Estates Drive (3/2, 1450sf, 23,697sf lot with a swimming pool, initially listed at $799K). The “expensive” house is 2884 Estates Drive (5/4, 2856sf, 11,543sf lot, initially listed at $1,050,000 later reduced to $1,025,000). The “cheap” house does a huge back yard, and a pool (which typically adds $0 in value around here) – but it’s much smaller than the “expensive” house, and the interior hasn’t been updated pretty much since it was built in the 1960s. The “expensive” house was “refreshed” prior to sale – the kitchen was updated, but not luxuriously so. The baths are original 1960s, but the rest of the house has been cleaned up with new high-grade laminate flooring, carpet, and fresh paint throughout. Well guess what happened? The “cheap” house got 6-7 offers in just 5 days on market. The house is now under contract, and the list price has been boosted to $895,000 – which pretty much means that the contract price on that is $895K. The “expensive” house has been on the market for 56 days, with no offers. It’s going to sit, and sit…and sit. A lot of folks around here own condos and townhouses, and they’ll be interested to know that the median price for condos and townhouses in Aptos in October 2016 was $550,000 – that’s a 15.9% drop over a year ago, and also down 9.5% month over month. On the flip side, 9 condos and townhouses sold in the month, and that’s up 125% from a year ago, when just 4 sold in October 2015. The condos which sold did so in an average of just 37 days on market, and sellers received 98.4% of full asking price! Not too shabby – but sellers did a bit better last year. In October 2015, sellers got their Aptos condos and townhouses sold in an average of 26 days and for 101% of full asking price. It has been four months since my last Aptos real estate market update, back in June. Back then, I had some actual news to share. The real estate report was no longer the same story of rising prices with crushingly low inventory. Prices were still rising back in June, but the number of sales had dropped and the supply of homes reached nearly six months – the biggest supply we’d seen in quite some time, and as everyone knows, greater supply often leads to lower prices. The spring and summer selling seasons are long behind us, and we’re well into autumn. Far from being a dead time of year, some of the highest prices for Santa Cruz Real Estate are recorded in the autumn months. So how is the Aptos real estate market holding up these four months later, in October 2016? The answer is, it’s been stronger – Zillow gives Aptos a “market health” of 7.5/10 – which is rated as “good” but not “excellent” as we’ve seen in the past. Homesnap rates Aptos at 81/100 – “healthy” – but not “very healthy” as we’ve seen it not so long ago. But here’s what you really want to know – the median home price for single-family homes in Aptos in September 2016 was $805,000 – which is down 9.3% compared to a year ago. Speaking of good and healthy: that perfectly describes this year-over-year price drop, if you ask me. The number of homes sold was also down; only 29 homes were sold in September 2016, vs. 40 in September 2015, a drop of 27.5%. But the news wasn’t all bad: homes sold for 99% of asking price, and a year ago homes received just 96.9% of full list price. Also, the 29 homes that sold did so in an average of just 34 days on market – compared to 46 days on market a year ago. It seems that while folks are paying less for housing this year than last year, the homes are selling more quickly – a mixed blessing for sellers. And here’s some more good news, at least if you’re thinking about putting your home on the market this year: we are back down to a 3 month supply, vs. a 6 months supply four months ago. There are 103 single family homes for sale in Aptos at the moment, with 33 under contract and just 70 available for purchase. That works out to just 95 days worth of inventory – or, not much competition for home seller, and a still-challenging market for home buyers. The market for townhouses and condos in Aptos is also also down compared to a year ago. Just four townhouses/condos sold in Aptos in September 2016 – compared to 11 in September 2015, a decrease of 63.6% year over year. The median price for condos in September 12016 was lower too – just $607,750 vs $672,500 a year ago (a drop of 9.,6% year over year). One interesting note about the condo market is that these 4 homes sold in an average of just 11 days on market – compared to 66 days on market a year ago. This is a good indication that well-priced homes will sell – and sell quickly – in Aptos. If you are planning to sell your condo or townhouse, please note that there is presently 150 days worth of inventory in Aptos, so don’t be too aggressive with your pricing.